What Happened to the “Black” in Black Music Month? In June of 2009, President Barack Obama proclaimed June as African American Music Appreciation Month. The President’s proclamation came thirty years after then President Jimmy Carter established June as Black Music Month, though it wasn’t made official until the 106th Congress (1999-2000) passed H.Res 509, the so-called African-American Music Bill. The post-racial sleight-of-hand in the re-branding of Black Music Month, made even more explicit with President Obama’s affirmation, highlights the subtle ways that the Black(ness) of Black Music Month has been muted for the more commercially viable African American Music Appreciation Month. What is lost when Black Music Month is no longer “Black”? As Dyana Williams, often referred to as the “woman behind Black Music Month” recalls, the idea for Black Music Month came in the form of pillow talk with ex-husband, Kenneth Gamble, who with Leon Huff was the architect of Philadelphia International Records (PIR). Gamble was enamoured with the work of the Country Music Association, and through the creation of the Black Music Association and in concert with others like broadcaster Ed Wright and Clarence Avant, who founded Sussex Records (Bill Withers) and later Tabu Records (SOS Band & Alexander O’Neal) helped lobby the Carter administration for some kind of public celebration of the value of Black Music. In a 2013 interview with The Root, Gamble is honest about his commercial interest in the founding of Black Music Month: “What happens when you have a music month? You get additional marketing dollars, and it helps to market and promote the artists,” also noting that theme for the month was “Black Music is Green.” Indeed, more than 30 years later, Black Music Month, like its more well known step-sibling Black History Month, offers an opportunity for labels to market “Black” music, cable networks like BET and TV One to offer “special” programming and for iTunes to discount its rather considerable digital catalogue. Recall, for example the deluge of “Black” titles that the trade publishers release in the weeks before Black History Month. To be sure, Gamble was always clear about the connection he saw between commerce and politics; between the record company he co-founded--via a groundbreaking relationship with Clive Davis and Columbia Records--and economic independence. The legacy of Mr. Gamble’s vision is mixed income housing and a charter school in Philadelphia. But Gamble was also very clear about the political value of the music. Where Berry Gordy, who was both inspiration and competition for Philadelphia International Record, branded his company “The Sound of Young America,” Gamble’s embraced the notion of the “message in the music.” While both men were committed to maintaining the bottom lines of their musical operations, Gamble believed that Black Politics was commercial, often packaging PIR with short essays to reinforce that point. The Philadelphia International Records catalogue is like a primer into Black consciousness in the 1970s; Billy Paul singing “Am I Black Enough for You? ;” The O’Jay’s offering “Don’t Call Me Brother,” Teddy Pendergrass’s sermon at the opening of Harold Melvin & Bluenotes “Be For Real” or the Three Degrees’s cautionary tale about sexual predators, “Dirty Ol’ Man.” I mention these particular songs to contrast the more celebratory songs in the catalogue like The O’Jays “Family Reunion” or The Intruders’ “I’ll Always Love My Mama” to highlight that Gamble and Huff mined both the pleasures and pitfalls of Blackness. Of course Gamble and Huff were not functioning in a vacuum; PIR was simply making explicit the historical claims of Black Music--Amiri Baraka riffing in the background “The spirits do not descend without music”--and they were not alone. The 1960s and 1970s, represents a unique historical moment when the commercial production of Black music and Black politics were publicly synchronous (it is always privately or non-commercially synchronous), in part because movement was profitable--a point that Robert Weems makes in his book Desegregating the Dollar: African American Consumerism in the Twentieth Century. The richness of the Black musical moment of the 1960s and 1970s is oft-romanticized, folks sometimes dismissing the structural needs that were met by making Black struggle commerical, bringing both curious White consumers and so called “conscious” Black consumers to the same mainstream marketplace; It was not accidental that television shows like Soul Train and The Jackson 5 cartoon launched nationally in the same era that Berry Gordy produced Lady Sings the Blues, Mahogany and Pippin, Columbia Records bankrolled PIR, or Clive Davis, who sanctioned the Harvard Report that foregrounded the creation of PIR, signed Gil Scott Heron as his first Black artist on his fledgling Arista label. When Black Music Month was created in 1979, the politics of Black Music were implicit. In many ways PIR’s clear devotion to aspirational, urbane Blackness, ironically became the means in which R&B and Soul music--the foundational music of the Black working class and poor, and the music in which the rank-and-file of Black communities most accessed political critique in music--jettisoned its connection to the everyday realities of Black life. With the massive crossover success of artists with deep roots in R&B like Michael Jackson, Lionel Richie, Whitney Houston, and to some extent Prince--all were marketed as pop artists in the 1980s--traditional R&B groups largely followed suit, pursuing music with more “universal” themes. Whereas the decade of the 1980s began with albums like Stevie Wonder’s Hotter Than July, where Wonder advocated for a national holiday for Martin Luther King, Jr. and paid tribute to Bob Marley, and Rick James’ Street Songs, which channeled his own days growing up in Buffalo, NY, the decade closed with albums by Babyface, Karyn White, Bobby Brown and Anita Baker. The exceptions at the end of the decade were the Hip-hop recordings that “crossed over” to the R&B charts, which mirror the ways that politics in Black music were shifted to rap music. Save a womanist critique that represented the sonic reflection of the burgeoning industry of popular Black women’s fiction in the late 1980s and 1990s, R&B was largely absent of politics. Unfortunately the legitimate political critique and social commentary offered by Hip-Hop artists were often undermined by the presumed pathology of Hip-Hop culture and the Black youth that it represented in the mainstream. When rap music itself became more mainstream than R&B, the gutting of political commentary in much of mainstream Black popular music had been made complete, so much so, that even the mention of political ideas and social movement, as is the case recently with recordings from D’Angelo and Kendrick Lamar, elicited wild excitement. 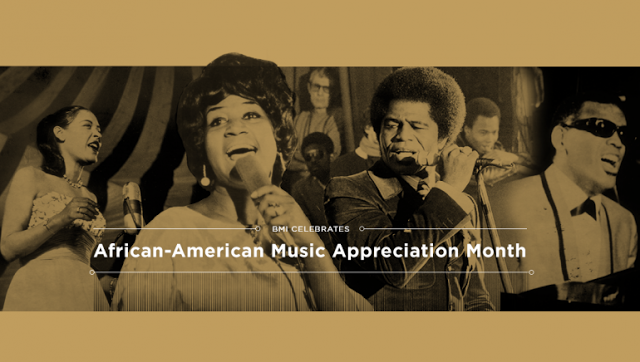 The notion of “African American Music Appreciation Month” speaks to the important contributions that Black artists have made to American culture, but the celebration is largely devoid of the very real political concerns that have always been a formative aspect of Black musical culture in the United States. While we can applaud the recognition of Black artists who are, in part, the architects of American music, to do so without explicitly naming the role of that music in the very social justice and revolutionary movements that have shaped this nation, is an insult to those musical traditions and those who crafted them. Mark Anthony Neal (@NewBlackMan) is Professor of African & African American Studies at Duke University, where he also directs the Center for Arts, Digital Culture and Entrepreneurship. Neal is the author of five books including Looking for Leroy: Illegible Black Masculinities (2013) and Soul Babies: Black Popular Culture and the Post-Soul Aesthetic and the host of the video podcast Left of Black. Neal has been celebrating Black Music Month with the hashtag #BlackMusicMatters.